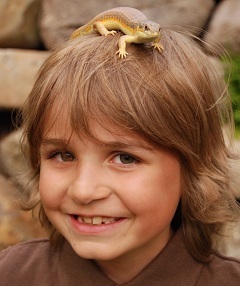 As part of your reptile or amphibian pet's physical exam and consultation, our veterinarian and staff will take a thorough history and discuss the ideal caging, temperature, lighting, humidity, and diet needs specifically for your species of pet. Remember to bring your UV bulb and fixture with you for UV output testing and a fresh dropping from your pet for parasite screening. Before your appointment take a photo of your pet's cage setup and email it to us at [email protected]. Why is UV lighting important? Most reptiles and amphibians require ultraviolet light exposure (specifically, UV-B) in order to absorb calcium from their food. A chemical reaction in the skin produces Vitamin D3, which then finds its way to the gut and acts as a key to the door that allows calcium to enter the blood stream. Without Vitamin D, calcium can not be absorbed from the gut. As part of every herpetological exam our staff will test the UV-B output of your bulb(s). We find that the majority of "UV" bulbs do not produce a sufficient amount of UV-B to stimulate the production of Vitamin D3. We occasionally find bulbs that produce too much UV-B, which can lead to sunburns and eye injury. Some species are more dependent upon UV-B to produce Vitamin D than others. Our doctors and staff will advise you on the needs for your specific species of pet during your pet's exam. Milwood Animal Clinic is the only Kalamazoo animal hospital testing bulbs for UV-B output utilizing Solartech's Solarmeter UVB Meter. We recommend a mercury vapor bulb to provide both heat and UV-B radiation. To learn more about ultraviolet lighting for reptiles and amphibians, go to www.uvguide.co.uk​. Gut loading refers to feeding your insects a high-calcium, high-vitamin diet 12 to 24 hours prior to feeding them to your pet. Most insects are nutritionally deficient with the exception of their stomach contents so gut-loading improves their nutritional content. We recommend and sell Mazuri High Calcium Gut Loading Diet for crickets, mealworms, superworms, Dubia roaches. In addition to providing essential vitamins, this diet is formulated to contain a high level of calcium for crickets and other feeder insects which are intended to be used in the diets of other animals. It helps balance the calcium to phosphorus ratio of the crickets and other feeder insects when they are consumed by other animals. Provide water with a damp paper towel or cotton ball. Do not use cricket cubes or vegetables for a water source because the insects will preferentially eat these items and will not be as nutritious when fed to your pet. What is a humidity box? A humidity box is simply a tupperware-type container that is about 1/2 to 2/3 full of damp sphagnum moss (do not use peat moss) with an access hole cut in the lid or side. Sphagnum moss can be purchased in the indoor gardening department at your local home improvement store, such as Lowe's. The box is designed to mimic the micro-climate many desert species seek in their natural habitats by burrowing down in the ground to find a more humid environment to assist with proper skin shedding and homeostasis. Place the box in an area of the cage that is in the middle of your pet's temperature range. Change the sphagnum moss regularly (every 2 weeks) to prevent mold and bacterial growth. Be sure the box is large and sturdy enough for your pet to comfortably get inside. Do not over-moisten the moss to the point that there is standing water in the box.This is an excellent way to facilitate a healthy skin shedding in lizards and snakes and prevent retained skin and spectacles. *What is a Basking Temp? Your pet's enclosure should have a gradient of temperatures within it, starting with a hotter, basking area on one end under the basking light (in most cases, a heat and UV-B producing bulb), and a "cool" spot on the opposite end. Because reptiles and amphibians are exothermic (cold-blooded), they cannot warm themselves internally or cool off by sweating so they must move their bodies to warmer and cooler spots as needed throughout the day. 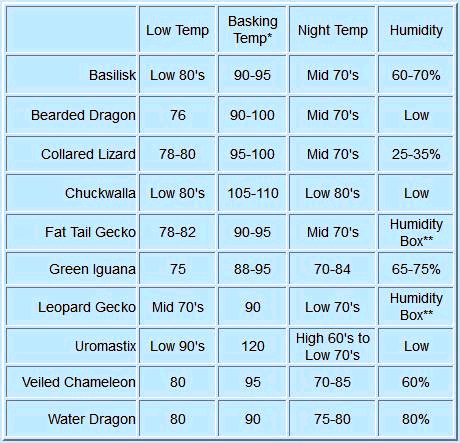 Providing a range of temperatures with all the possible temperatures in between the basking temperature and the cool spot will allow your pet to choose which temperature is best for it at any given time. If you see your pet spending most of its time in the cool spot, your temperature gradient may be too hot and if your pet spends the entire day under the basking light, your temperature gradient is probably too cool. Always have at least two thermometers in your pet's enclosure: one at the cool end and one under the basking light (at the level or height where your pet basks). Check these temperatures frequently to maintain an optimal temperature gradient. This webpage is not intended to diagnose your pet's illness, provide treatment, or make recommendations regarding health concerns related to your pet. If you have a medical emergency or a medical question, please contact Milwood Animal Clinic by phone at 269.342.9865; or consult your pet's regular veterinary health provider for assistance.